There are few gardens where every corner is always sunny. But plants grow everywhere, even in the shade. Some have specialized in it, others tolerate it, or at least partially. Fortunately, there are also some that we like to see in our vegetable garden. 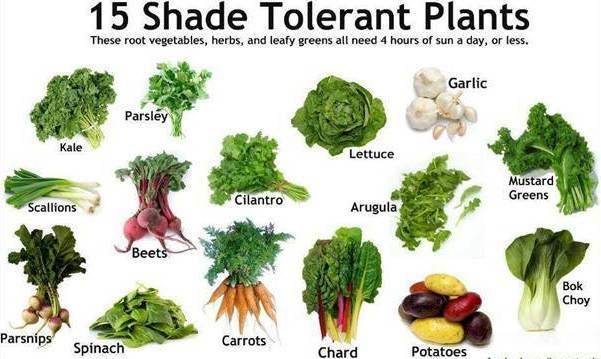 Usually those are vegetables and herbs that tolerate shade, but also want to have 2 to 4 hours of sun per day. Plants need light to grow. Without photosynthesis or chemical action (of chlorophyll ) is not possible. Shadow vegetables are more shadow tolerant vegetables. In the shade plants grow slower and the yield is less. Sow or plant not close together, give them the little light that is available. A gardening advantage is that the soil in the shade is less drying out. Partially impairing photosynthesis and chlorophyll green, we use also in the bleaching of vegetables, giving structure and taste of the leaves is milder and softer. Think of endive, cabbage, cauliflower and celery. Vegetables which bear fruits grow less well to poorly in shady places. Also for the maturing, they often need several hours of full sun a day. Plants that originally lived in the forest naturally tolerate shade. Think of wild strawberry (Fragaria vesca) (and hence strawberry) and wild garlic (Allium ursinum). Most leafy vegetables will tolerate shade. The young shade leaves are great for mesclum. This salad of French cuisine is a mixture of different types of lettuce dandelion petals, flowers, endive species, herbs and cabbage. The less spicy mesclun without seasoning is called "baby leaf". endive do it properly in the shade. cress also give a decent yield. Angelica has edible leaves that you can cook like spinach. The root is used as a medicinal herb. Also of Comfrey or symphytum the leaf is edible. There would be vitamin B12 in, which according to some sources is only in meat. You should not eat it too often (once a month) because there is less good stuff in it too. • put a couple of old windows or mirrors strategically as reflectors so that they reflect sunlight from elsewhere in the dark corners. Absolutely no light, so even in your basement, you can also still grow some cultures. So also in the shade. But that is limited to fungi (mushrooms) and chicory.